The diverse Ciaran Gribbin (formerly known as Joe Echo) returns in a new incarnation, this time round as a solo artist. Losing the pseudonym that saw him Grammy nominated, this is all Ciaran. With plenty of experience as lead singer of INXS ( in a hiatus of sorts) and the all too short lived Leya, Ciaran takes full control of his first solo EP. The EP features five tracks all of which were written before joining INXS. 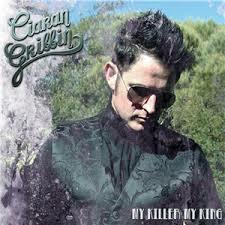 The lead single from this EP is My Killer, My King which is co-written by Johnny McDaid (Snow Patrol). It’s a delicate rock song with a sing along chorus that should help get it over with an audience. It also has a soft and effective percussion sound driving the song along. My Killer, My King is a favourite song of Ciaran’s it is one of the main reasons why he wanted to do an EP in the first place. Having sung backing vocals on the Snow Patrol song Eyes Open a friendship was struck up with the band and was one of the reasons leading to the EP being recorded in McDaid’s studio in London. Damage sees Ciaran being emotionally vulnerable and honest. He is appealing to the lady in his life, wondering if he’s good enough. Seeing her as a piece of perfection “lady you’re more than good for me” but wondering if the end is near for them or at the very least the place they are in at the moment. The theme of wanting more and not being sure that it’s possible to achieve it where he is, is one that is sure to resonant with people. Another highlight is Who Am I. Sounding like it’s sung through an old style microphone it sees Ciaran questioning himself, “I’ve been searching high and low but I still can’t find myself”. The song is very simple sounding but rich, featuring a ukulele and slide guitar it’s a haunting song full of atmosphere and heartache. This EP marks a change of pace and should be the beginning of a very successful period for the Northern Irish man. Next year you can hear one of Ciaran’s songs being sung by Al Pacino in his new movie Imagine. He is also is off to play Rio de Janeiro next month for a festival there. This EP is an absolute joy to listen to. Everything works; music, lyrics and atmosphere are all beautiful, engaging and emotionally powerful. Ciaran has had a lot of press, in particular in Australia and Northern Ireland as lead singer with INXS from 2011, but this EP should really see his name appear on its own merits. A full album is planned on the back of it and what an album it promises to be if this standard is maintained. Sadly there are no plans to do a full scale tour so just enjoy the songs on offer here and maybe he might change his mind!